On May 5th, the Canadian Institute of Marine Engineering announced the 2016 winner of its Medal of Excellence. The National Council conferred the award on Mr. Ken Harford P.Eng., retiring Managing Director of Robert Allan Ltd. The presentation was made in absentia at Mari-Tech, Canada’s annual marine technology exhibition and conference in St. Johns, Newfoundland. Ken graduated from UBC in 1970 with a B.A.Sc. in Mechanical Engineering and started his career as a consulting Acoustical Engineer, a business that evolved into the consulting firm of Harford Kennedy Ltd (now BKL Consultants Ltd). Through that business, Ken began a long association with the BC tugboat industry. He led a detailed study of the noise levels aboard local tugboats which resulted in new noise control regulations in the industry, and fostered in him a passion for ensuring that tugs are designed to be as quiet and vibration-free as possible. Ken’s commitment to this subject has been a major factor in leading Robert Allan Ltd. to the situation of prominence in the international tug industry which it enjoys today. Ken later joined forces with Steve Hui creating Mechtronics Research Corporation (MRC) in 1975, moving into the field of manufacturing control systems for Z-drives on tugs. In 1981, this work evolved into the establishment of IMPEG (Industrial Marine Power Engineering Group) as distributor of Niigata Z-Peller drives using Mechtronics controls. During this period Ken was involved in the delivery of many of the first Z-drive tugs in Canada for companies such as C.H. Cates and Sons and Seaspan. Ken joined Robert Allan Ltd. in 1988, acting principally as the senior Project Overseer for new construction, where he was responsible for QA and vessel completion oversight for numerous Z-drive tugs (primarily for American clients) and a variety of diverse other craft. From about 1994 onward, Ken assumed the role of Vice President of Engineering at Robert Allan Ltd., directing all aspects of the mechanical and marine engineering work within the company. For the next 20 years Ken led the firm’s engineering group, encouraging the strongest standards of design excellence in the development of a world-leading suite of high-performance tug designs for a worldwide client base. In 2008, Ken assumed the position of President at Robert Allan Ltd., overseeing the transition of that company from a privately- held company to one of employee ownership. He turned over that position to Mike Fitzpatrick in 2015 and has remained as Managing Director until his retirement at the end of April 2016. He is a Registered Professional Engineer in B.C., a member of the Institute of Marine Engineers and a member of the Society of Naval Architects and Marine Engineers. Ken retires from Robert Allan Ltd. after 28 years of truly dedicated service and leadership, and as a driving force behind the success of the company, now in its 86th year of continuous business in Vancouver. Everyone in this company owes him a great debt of gratitude for all he has contributed to its collective success. Moreover, the industry at large has benefited immensely from his talents and capabilities in establishing standards of excellence in marine engineering and design. 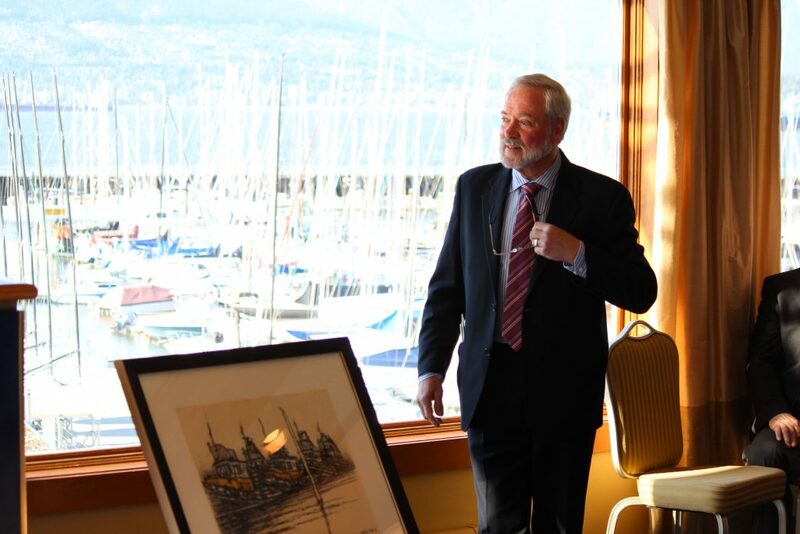 A reception was held in late April at the Royal Vancouver Yacht Club to recognize Ken and his many significant contributions.